Well controlled entry and exits. Well maintained, very nice staff. Pull throughs just barely fit my 36' coach with 2dr wrangler toad without unhitching. Gravel & level. Lots of various fruit bearing trees. Nice little shop, pool, laundry and showers. Nice size book exchange program. 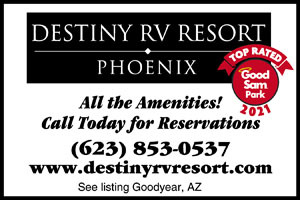 We stayed at the Destiny Phoenix RV Resort for 4 day in late Dec 16. Very clean and good people running the resort. Convent hook ups, level pad and site. Good pull thru. Would return again when we head back to AZ. Loved the park; loved the office (and people in it). this place was clean, beautiful, and welcoming. It's a park that we would consider wintering in (when the time comes). all i can say is wow! what a improvement,when we heard the park was under new ownership we were a little nervous at first, but after seeing the drastic updates on the park we are thrilled!!! from the all new stadium style pickleball court, the revamped fitness center, the new pavement throughout park, all new pool and new dogrun. 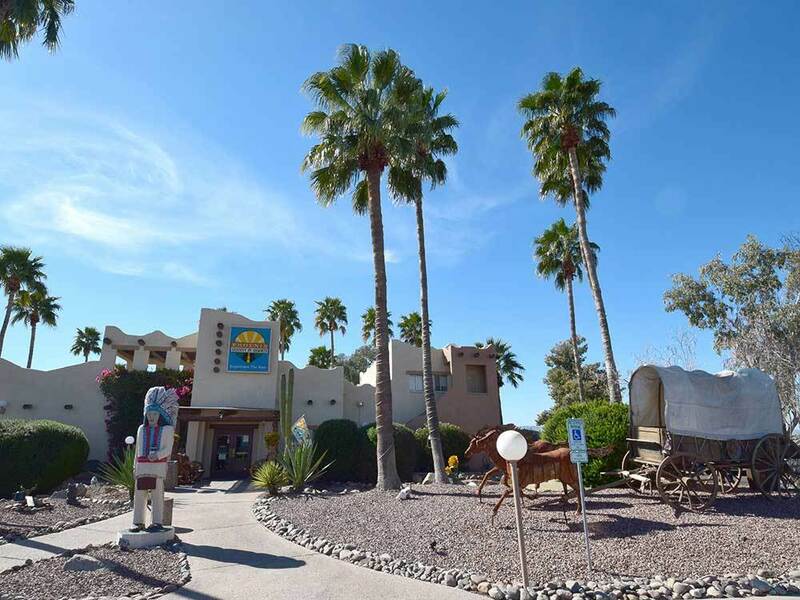 we have stayed here numerous times throughout the past 15 years and the park has never looked better. The helpfulness of the new manager made things very easy. For all the parks we stay at as full time retired RVer's this is by far the nicest in the southwest and we will continue to stay here, heck we might even stay here full time! Highly over rated. Badly in need of routine maintenance. Trees overgrown, space asphalt in need of repair, and power pedestal infested with spiders and connections/switches corroded. Pull thru spaces were too narrow/short for our 38 foot Class A. Could not extend one slide and no room for tow vehicle. This may have been a "10" at one time but not now.